Walking Dead Wednesday? 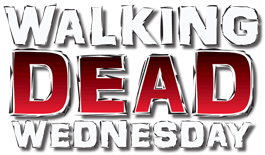 More like "Walking Dead Wetsday," amirite? Oh wait, that won't make any sense until you read the review. When I first unboxed this figure, I thought it was meant to represent the Muddy Walker, from Season 4, Episode 8, "Too Far Gone." But upon closer inspection, there are a few problems with that: he'd have to be covered in red clay, not tan mud; he should be wearing a shirt, not just pants; and in general, each series of Mystery Minis is based on a season whose number is one higher - in other words, Series 4 is full of Season 5 toys. So who is this? The popular name for this toy seems to be "Slime Walker," but that's a stupid name. Funko doesn't provide any, and the show doesn't provide any, so why on earth would anyone settle on "slime"? Call him Soggy, call him Waterlogged, call him Drowned, call him anything but "Slime." Remember after the group met Father Gabriel, and he led them to a nearby food bank? It was flooded, and when they went down inside, this friendly fellow popped up from under the water looking for a bite to eat. 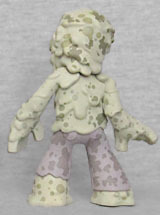 We already had one sopping wet walker in the form of the Well Zombie. That one was big and bloated, but it was also a long time ago: the zombies in Walking Dead are getting progressively more decayed, and all the ones in the Food Bank have clearly already made it through the bloating stage and then popped. His skin is stretched out and hangs loosely, even spilling down over his jeans. He's twisting to the side and his head is held at an angle. The skin is undead gray, and he's covered head to toe in dark splotches. It's wonderfully gross! 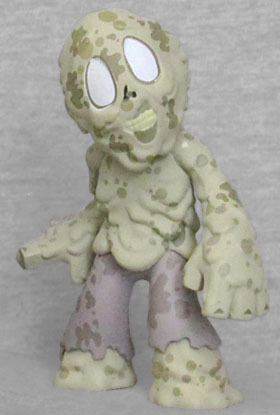 The Soaked Walker, like all the zombies in Series 4 (other than the Flaming Walker), is available in a 1:12 ratio, meaning you're pretty much guaranteed to find one in every box. In fact, there are 10 1:12 figures in Series 4, which means each case only has two blind boxes with anything of higher rarity.